When a collection comes into the WLA, a staff member looks at all of the records and comes up with a processing plan to organize the collection and make it accessible for users. Depending on the amount of material, type of material, and how much the donor originally organized it, some collections can be processed quickly and others take months. The goal of processing is to make all of the material easy to find for the user. Founded in 1974 by six Catholic organizations located in Chicago Illinois, the organization the 8th Day Center for Justice is an inter-faith coalition that strives to do social justice work that impacts Chicago and the surrounding communities. 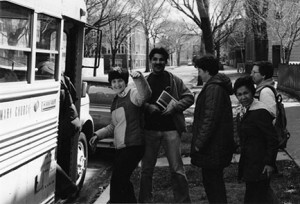 For nearly 40 years the organization has made a difference in the lives of hundreds of Chicagoans, many of them women. In their efforts to help women, they have broadly invested in issues such as education, war, universal human rights, poverty, and homelessness. Drawing from firm and long-held religious beliefs, the organization’s activism is peaceful and concentrates on consciousness raising, community organizing, workshops, and lobbying. 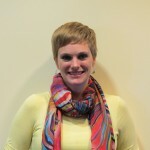 The Urban Plunge, one of the organizations longest running programs has occurred annually since 1977. This Easter Week event is a weeklong faith-based immersion program in which participants engage with the city of Chicago through exploring its spaces and meeting local community and religious leaders and organizations actively making an impact. Formulated to encourage participants to analyze their surroundings and utilize their talents, the tour creates a space for participants to brainstorm solutions for the problems and challenges facing contemporary society. 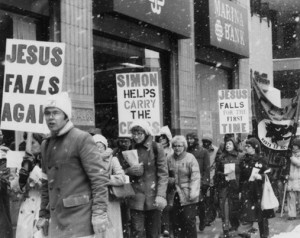 In 1981, 8th Day Center began an annual event called the Good Friday Walk for Justice, to draw attention to contemporary social justice issues concerning racial, economic, and legal inequalities. Themes of the walk are different every year and generally have a historic or religious significance. The event leads participants to five different locations positioned to create a cross in downtown Chicago. Led by a coalition of social justice and faith organizations with prayer and reflection built into the script, the event encourages individuals to act and provide voice for those who are unable to speak. From their general events such as the Urban Plunge and Good Friday Walk for Justice to participation in national movements such as the Sanctuary Movement and advocating for the Equal Rights Amendment, 8th Day contributed to debates not just on local issues and topic, but national and international ones as well. The organization has specifically explored the conditions of women in Asia. Within the United States, they have commented on issues of discrimination, employment, violence, and women’s ordination.